It is vital that we maintain the environment’s health. An important step in improving the global environment begins with putting glass, paper, and plastics into their respective bins. Glass can be recycled indefinitely without any loss of purity. Recycling glass has several benefits, as it helps to reduce CO2 emissions, decrease the demand for energy, and saves on raw materials. Yet, when recycling glass, we need to do more than just separate bottles by their color. As not all glass is identical, it can be a challenge to correctly separate it. 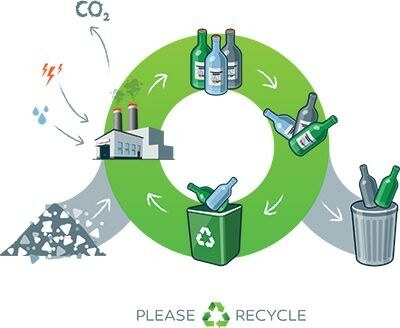 A closed-loop system is used when recycling glass, which means that it is recycled in order to produce more glass. This saves on the raw materials which are required during the creation of new glass. The recycling of glass is particularly beneficial to the environment as, in contrast to plastic, glass can be recycled and reused indefinitely, as long as it does not contain any contaminants. In a range of products such as smartphones, manufactured goods, and cookware, unrecyclable glass materials like clay garden pots, crystal, and ceramics are increasingly being used. These often contain contaminants such as lead which are hazardous to human health. Even if there are not any harmful contaminants present in unrecyclable glass, the majority of them have varying chemistries and melting points which exceed that of regular glass. These properties can possibly damage the cutting systems and glass furnace when recycling, as well as potentially creating impurities in new glass material. The separation of contaminated waste from recyclable glass is particularly important given that an average of 33% of new glass containers are made from recycled glass. In order for recycling to be practical, these materials must be separated with the use of a reliable, affordable, and fast system. In modern single-stream recycling, all of the material which is to be recycled gets placed onto a conveyor on which it undergoes a separation process comprised of several steps. It is possible to reliably separate ferrous and nonferrous metals (such as aluminum), as well as paper and glass. Once the process has finished, the glass is crushed into tiny pieces which are called cullet. The cullet then progressed to the reclaiming facility, at which point glass which is not recyclable must be removed. Traditionally, people who have recycled glass have used visual/infrared or magnetic sorting. However, there are limitations to each of these methods. For instance, recyclable glass and ceramic glass share similar physical properties and are only distinguishable by virtue of their chemistry. How, then, are we to efficiently separate unsafe materials from safe, recyclable glass? The material chemistry of samples can be determined using XRF technology. 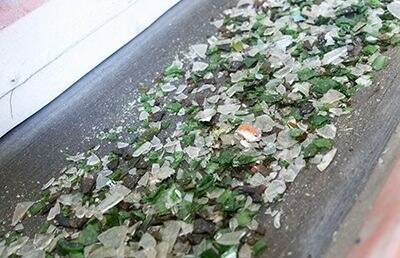 XRF has the ability to identify and separate contaminated glass fragments from recyclable glass using their respective chemical compositions, which makes it useful when sorting glass. A handheld XRF analyzer (HHXRF), for instance, is able to detect ceramic identifiers like lead, zinc, and titanium in material fragments as little as 1 mm (0.04 in.) in diameter. It is possible to then manually remove these fragments from the safe, recyclable glass. Yet, because more than twenty tons of cullet is processed in a glass recycling plant every hour, manually separating the identified unrecyclable glass becomes impractical. Luckily, it is possible to scale XRF to in-line, high-speed systems. Twenty-eight tons of glass cullet can be processed every hour by the X-STREAM in-line X-ray fluorescence analyzer, which is designed for high volumes and uses numerous detector arrays in order to ensure the reliable separation of even the smallest fragments. The X-STREAM Glass: sort glass cullet while it passes under the arrays and separate contaminated fragments away from safe glass with the use of a blast of air. Once the contaminated glass has been separated from the recyclable glass, the endless cycle of glass recycling is able to continue safely.